There is no secret that “Tobacco-Stained Mountain Goat” and “One Hundred Years of Vicissitude” made Andrez Bergen a favorite around this blog. There is hardly a secret, since I’ve trumpeted often, wide and long enough, that I am falling way behind with my readings, reviews and interviews and as much as I dislike this fact Andrez Bergen’s “Who is Killing the Great Capes of Heropa?” is one of my most anticipated books still waiting unread on the bookshelves. Well, it is time to put a stop to all the complaining and start acting, therefore, I believe a reading goal for the remaining of 2014 is in order, despite dropping altogether any such objectives a while back. 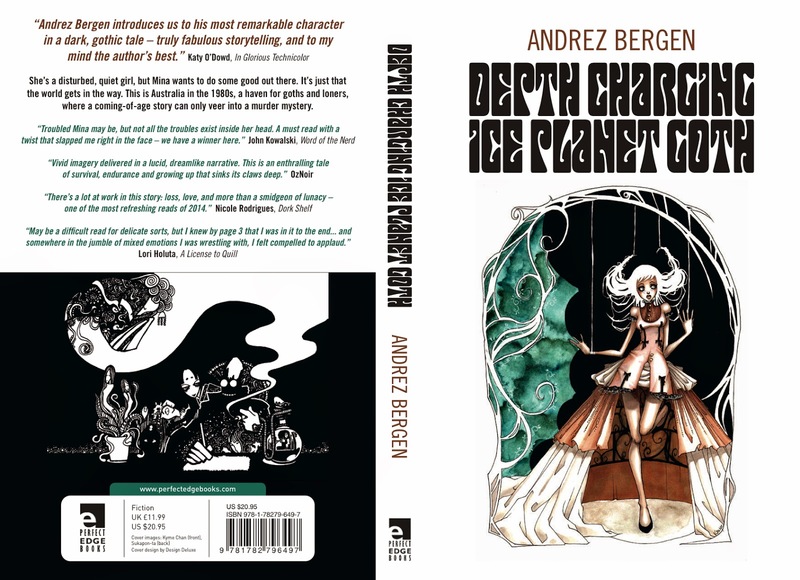 So, by the end of this year I will do my best to not only read “Who is Killing the Great Capes of Heropa?”, but also Andrez Bergen’s new novel, “Depth Charging Ice Planet Goth”, released today by Perfect Edge Books. And with that said I think it is time to start putting some effort behind my attempt of achieving the said objective, but not before congratulating Andrez Bergen on his new book release day. A wild carnival of a novel that treads Kafkaesque territory and spills over the rails to plumb the depths of a murder mystery. She's a disturbed, quiet girl, but Mina wants to do some good out there. It's just that the world gets in the way. This is Australia in the 1980s, a haven for goths and loners, where a coming-of-age story can only veer into a murder mystery.